She explained that, while “teach for understanding” seems obvious, all too often the focus is on teaching to prepare students to pass a test or for the next course. In science education specifically, research shows that students’ ideas about natural phenomena tend to be resistant to change, that learning in one class does not transfer well to other content areas or contexts outside the classroom, and that learning too often consists of disconnected bits of information rather than an understanding of how these pieces fit together as a conceptual whole. See Tamara’s presentation slides HERE and the video HERE. See Pinky’s presentation slides HERE and the video HERE. Lots of other good information here as well. I can imagine using parts of these during professional development or during opportunities to make the case or advocate for STEM education. You can see all of the presentation materials and videos from the 2011 WSAS Symposium HERE. 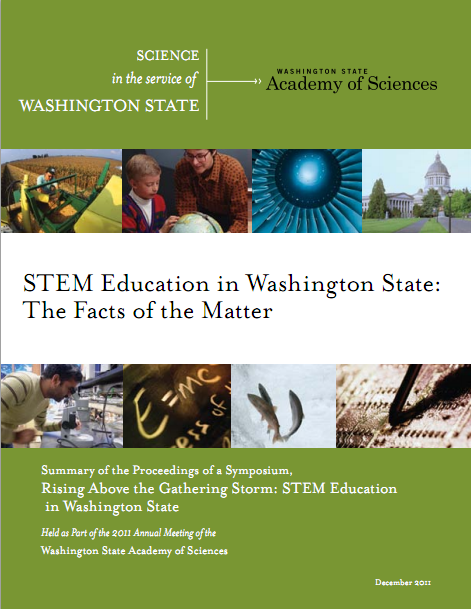 This entry was posted in STEM, Washington State Science. Bookmark the permalink. Excellent resource here and I like the quotes that you grabbed out of the report- especially Tamara’s!